Can two compressors make it easier to fashion a smoother vocal performance before you resort to detailed volume automation? Even a well-trained singer’s voice can be incredibly dynamic, but in most modern musical styles every word must be heard clearly, so those dynamics need controlling. To create a more even average level without making the vocal sound obviously processed, a compressor must generally do two things: tame wayward peaks; and gently massage the level, on a word-by-word basis. If you don’t want a compressor’s action to sound obvious, a good rule of thumb is to aim for a maximum of 3-6 dB of gain reduction — but with really dynamic parts, this won’t be enough. Furthermore, given the varying timescales over which volume variation can occur (by phrase, word, or syllable, for example), finding attack and release values that work for the entire performance can be impossible. To overcome this, we can use two different compressors, each solving a different part of the equation. A common tactic is for the first compressor to tame the highest peaks, and the second to apply a gentler dose of level control. Traditionally, the 1176 FET compressor has been a good candidate for the first stage, as its very fast attack and release mean it can ‘grab’ the loudest peaks quickly and get out of the way as soon as the level drops. The LA-2A optical compressor’s relatively slow attack and release make it a popular choice for the second stage. As I discussed in November 2016 (http://sosm.ag/cubase-1116), Cubase’s Vintage Compressor and Tube Compressor plug-ins are inspired by these classic pieces of hardware: the Vintage Compressor, with it’s option for super-fast attack (<1ms) and release (<10ms), mimics the 1176, while the Tube Compressor’s LA-2A origins are perhaps less clear — there are more controls and faster attack/release times available than on the LA-2A. I’ve used both in my examples. The first screenshot [above] shows some suggestions targeted to suit the vocal used in my examples, but different performances will demand different settings. It’s a good idea to configure the compressors one at a time. For the ‘peak catching’ Vintage Compressor. I set a pretty fast attack (2ms) and an 8:1 ratio, so it clamps down any peaks quickly. The fast release (10ms), should prevent unwanted gain-reduction on the lower-level sections of the vocal. Like the 1176, the Vintage Compressor has no threshold control: the threshold is fixed and you adjust the Input knob to push your signal above it, while paying attention to the amount of gain reduction. When using this compressor with such settings on unprocessed pop/rock vocals, you can safely increase the input until you see the 3-6 dB of gain reduction during peaks; in my example, this meant I occasionally saw about 1dB of gain reduction elsewhere. While not essential, I adjusted the Output knob so the peak output level was similar to the peak input level. With the peaks tamed, this ensured a sensible input level for the second compressor. We want the Tube Compressor plug-in to even out the remaining dynamic variation in the vocal without squashing all the life out of the performance, so choose the Low ratio (around 3:1). Faster attack times tend to result in greater ‘smoothing’ of the levels, so experiment to find the sweet spot. The 20ms attack in my example means this compressor will still grab louder sections fairly quickly but a little more slowly than the first one. The release is slightly trickier to judge, but the meter can guide you: aim to let the compressor release fully and fairly promptly as each word or phrase is completed. I opted for 100ms in this case. 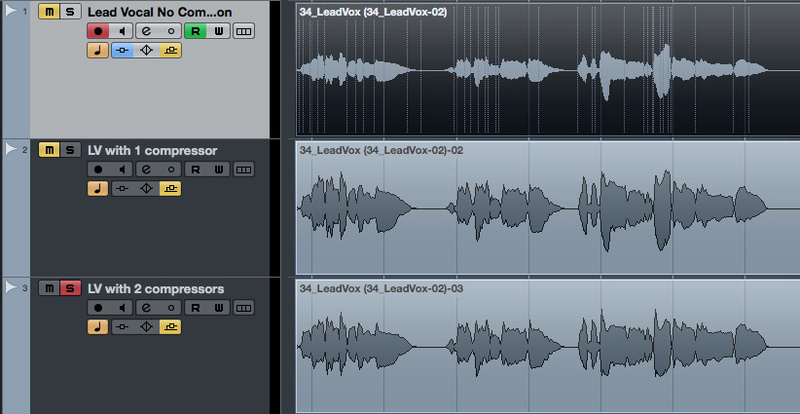 The unprocessed vocal (top), with the first compressor applied (middle), and with both compressors applied (bottom). Again, we’re aiming for a moderate maximum of 3-6 dB gain-reduction: adjust the Input level until you see that. As we’ve already attended to the really big peaks, the Tube Compressor will probably be active much of the time, but often applying only 1-3 dB of gain reduction. Again, tweak the Output level control so the input and output peak values match, to ensure a sensible level is passed on to the next stage in your signal chain. After two stages of compression and make-up gain, not only will the dynamic range now be much more manageable, but the average level will be higher too. Having rendered out this short clip with the compression applied, you can see the ‘before’ and ‘after’ results in one of the screenshots. As a slight aside, there’s some ‘character’ inherent in the 1176 and LA-2A circuitry — feel free to use the Tube Compressor’s Character and Drive controls if you want to try and emulate some of that; the Drive option can work particularly nicely with vocals, though you’ll usually want to use it in moderation. If two compressors can be good, maybe three compressors could be even better! I adopted a broadly similar approach, with my first compressor acting fast, to hit the biggest peaks with a high ratio, and then with the second and third set to slower attack/release times, lower ratios and lower thresholds. Experimenting with the attack times in the third compressor can allow you to re-introduce some dynamics in a controlled, consistent way. This helps you to avoid the end result being completely squashed — I chose a slower attack in my example for this reason. Once again, I aimed for a maximum of 3-6 dB of gain reduction from each compressor and added a small amount of make-up gain before passing the signal on. Three times six is 18 — and 18dB is obviously a hell of a lot of gain reduction to apply to a lead vocal! But at no single point are all three compressors operating flat out. Three gentle stages of compression, with different attack/release times, mean they each do different jobs at different times, and the end result is a very smooth, solid vocal part that should sit very easily in a mix with a minimum of additional volume automation — though it still retains some of the natural volume variation borne of an expressive performance. Again, the unprocessed vocal is at the top, with each subsequent waveform illustrating the effect of each stage of compression. The slow attack used in the third compressor (bottom) deliberately re-introduces some dynamics in a very controlled way. Modern pop/rock vocals are at their very best when allowed to be expressive, but they usually need assertive dynamics control so the lyrics can be heard clearly. Yes, you can achieve this with detailed volume automation but stacking Cubase’s stock compressors can get you a long way down the same route with far less effort; you’re still free to refine the result with a little automation but you should find it a little easier. And remember, this technique isn’t only applicable to vocals — for any sound source with unruly dynamics, if you need stacks of control, why not try stacking some compressors? You’ll find two audio examples in the righthand sidebar of this article, one of two stacked compressors, the other three. In each case, the audio consists of a solo verse/chorus section of a lead vocal. First you hear the unprocessed vocal, then the same part with one compressor added, then with two, and finally, in the second example, with three. No other processing (eg. gating, EQ, reverb, delay) was applied. The examples feature vocals from Cristina Vane’s track ‘So Easy’, the subject of a Mix Rescue by Mike Senior in SOS September 2013. Thanks to Mike and Cristina for permitting their use. You can find out more about Cristina’s music at www.facebook.com/cristinavanemusic and www.soundcloud.com/cristinavane. You can also check out her ‘Jam In The Van’ performances on YouTube.